Calvary Baptist Church was organized in 1847 as the Hope Chapel Baptist Church. Its original members had left the Stanton Street Baptist Church when its pastor, the Rev. David Bellamy, resigned. The new congregation, with Mr. Bellamy as preacher, held services in the Coliseum, a public hall at 450 Broadway near Grand Street, until Hope Chapel was built at 718 Broadway. Under the leadership of the Rev. Dr. Robert Stuart MacArthur, who became pastor in 1852, the members were persuaded to remove the church to a site farther uptown. A new brownstone church was erected in 1854 at 50 West 23rd Street, near Madison Square, and the society was renamed Calvary Baptist Church. There was great opposition to the move because the members thought it was too far away. Some of them rode to church on horseback and hitched their horses to the trees. By the 1880s, the area along 23rd Street near Madison Square Park had become crowded with commerce and amusements, and the congregation needed larger accomodations. Property was purchased on West 57th Street, between Sixth and Seventh Avenues, and a new church was designed in 1883 by John Rochester Thomas. The Gothic sanctuary was constructed of red sandstone and featured three towers, one of which had a very tall steeple, and a facade with five porches along its generous 160-foot street frontage. Inside, a 100-by-100-foot auditorium had amphitheatrical-style seating in curved rows on a steeply sloped floor, with additional seating in a shallow gallery that encircled the room on three sides and a portion of the fourth. The deep-toned decor was countered by natural light from the south-facing rose window, and from an opening in the west wall and clerestory windows above. The new sanctuary was opened on December 23, 1883. Plans were filed in 1929 for what is arguably the most notable "Skyscraper Church" in the city. Located on the same site as the 1883 Gothic edifice, the present 16-story facility opened in 1931. It includes space for the church and a Christian bookstore on the lower floors, a parsonage on the 14th floor, and an apartment hotel occupying the remainder. Designed by Jardine, Hill & Murdock, the building was developed by Vincent J. Slattery and Morris H. Rothschild, who also created similar buildings for the Church of the Strangers and the Second Presbyterian Church. The organ in Calvary Baptist Church was built in 2002 by the Wicks Organ Company of Highland, Illinois. Often described as a "hybrid" or "combo" organ, the instrument combines 15 pipe ranks by Wicks with 51 digital stops by the Walker Technical Co. of Zionsville, Pa. Wicks installed the various components in exisiting chambers at each side of the choir loft, and provided a pipe facade behind the choir seating. Antiphonal speakers are at the rear of the sanctuary. The organ is played from a detached three-manual drawknob console. As part of the church's 125th Anniversary Celebration, the Allen Organ Company installed a custom three-manual digital organ, replacing the previous Welte-Tripp/Möller pipe organ. The instrument was a custom System 3300 that had 11 MOS-1 computer systems and 22 audio systems channeled into 14 amplifiers and 30 speaker cabinets. The organ was dedicated on February 27, 1972. In 1958, the Möller company rebuilt the existing Welte-Tripp organ. This job included a new four-manual drawknob console and the addition of display pipes finished in gold. For their new and present building, Calvary Baptist selected the Welte-Tripp company to build a new organ. Installed in 1930, the organ was designed by Charles Courboin and voiced by Richard O. Whitelegg. The organ was installed in chambers above and behind the choir loft, while the four-manual drawknob console was located in the front center. The following stoplist, taken from The Diapason (May 1930), indicated that manual ranks had 73 notes. Exact pipecounts were not given and are suggested, based on other Welte-Tripp organs from this era. 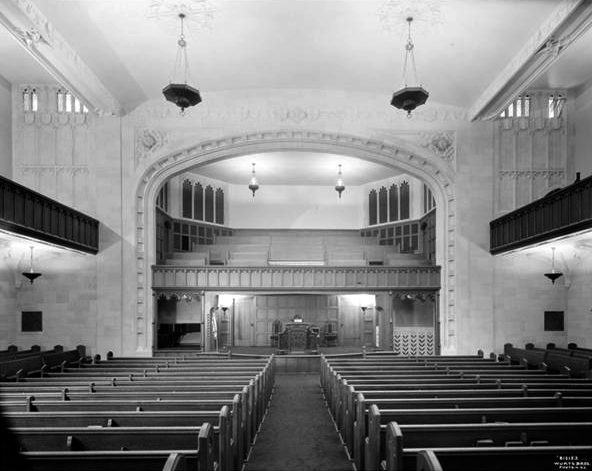 For the new Calvary Baptist Church on West Fifty-seventh Street, an organ was built by the J.H. & C.S. Odell company. Odell also built the architect-designed cherry wood case that included decorated or silvered display pipes. The contract, dated July 1, 1882, stated that the cost of the organ would be $12,500, with an allowance of $1,100 for possession the R.M. Ferris organ (1856) in the old church on West Twenty-third Street. Should the church be able to sell or dispose of the Ferris organ before December 20, they would pay the $1,100 to the Odell company. It is believed that this organ was later rebuilt by the U.S. Pipe Organ Co., who also provided a new five-manual console. "Our celebrated Pneumatic Compositions made by thumb knobs between manuals." Pneumatic Compensating valves to be applied to Great, Swell, Solo and Pedal Organs. Pneumatic Tubular action to be applied to bass notes in such a way that the pipes will take their wind direct from the bellows and not from the wind chests to rob the wind from the smaller pipes. By this method we insure a full supply of wind to every pipe, and no falling off in Power when the full organ is drawn. Double acting Pneumatic levers to be applied to Great, Swell, and Pedal draw stops. Ferris built this organ for installation in the Crystal Palace, which was located at Sixth Avenue and West Forty-second Street next to the city reservoir on land which is now Bryant Park. However, due to a dispute between Ferris and the Crystal Palace committee, the organ was instead sold to Calvary Baptist Church. This organ was replaced in 1882 by the J.H. & C.S. Odell organ, Op. 194, and the Ferris organ was moved to North Baptist Church in Greenwich Village. Allen Organ Company. Specifications of Allen Custon System 3300 organ (1972). Courtesy Tim Yoder. Bowen, Jonathan. Specifications of Welte-Tripp Chapel Organ (1930). "Calvary Baptist Marks 100th Year," The New York Times (Nov. 4, 1946). The Diapason (May 1930). Specifications of the large Welte-Tripp organ (1930). Courtesy Jonathan Bowen. MacArthur, Robert S., and Frank R. Morse. History of Calvary Baptist Church, New York. New York: E. Scott, 1890. J.H. & C.S. Odell & Company brochure, "Metropolitan Churches," 1896. Courtesy Jeff Scofield. "Observance of the Semi-Centennial of the Calvary Baptist Church Last Evening," The New York Times (Feb. 27, 1897). Scofield, Jeff. Factory Specifications of M.P. Möller Organ, Op. R-601 (1958). Trupiano, Larry. Factory Contract and Specifications of J.H. & C.S. Odell organ, Op. 194 (1882). Wicks Organ Company web site: http://organ.wicks.com/. Specifications of Wicks Organ, Op. 6398 (2002). Allen Organ Company. Photo of Allen Custom System 3300 organ (1972). Courtesy Tim Yoder. Calvary Baptist Church. Postcard (1967) showing M.P. Möller Organ, Op. R-601 (1958). Courtesy Sebastian Glück. The Diapason (May 1930). Welte-Tripp console. Courtesy Jonathan Bowen. MacArthur, Robert S., and Frank R. Morse. History of Calvary Baptist Church, New York. 23rd Street Church. Lawson, Steven E. Interior; Wicks Organ, Op. 6398 (2002). Metropolitan Churches, J.H. & C.S. Odell & Company brochure, 1896. J.H. & C.S. Odell Organ, Op. 194 (1882). Courtesy Jeff Scofield. Nickerson's Illustrated Church, Musical and School Directory of New York and Brooklyn. New York: Nickerson & Young, 1895. Exterior of 1883 building. Wurts Bros. (New York, N.Y.). 1930 photo of interior.